After another very bullish day on SPX we are now at a very important cusp, having come very close to a new high overnight. The first channel with black trendlines is the main wave 5 rising channel. 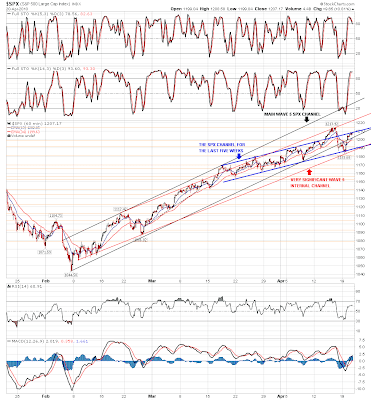 In the last move down the lower trendline was broken, and SPX has retested and broken back above that trendline. This channel is particularly significant because the top trendline may be the target for a large potential IHS building on ES at the moment. The second channel with red trendlines is a very significant mainly interior channel with multiple touches that is almost as longstanding as the main channel. 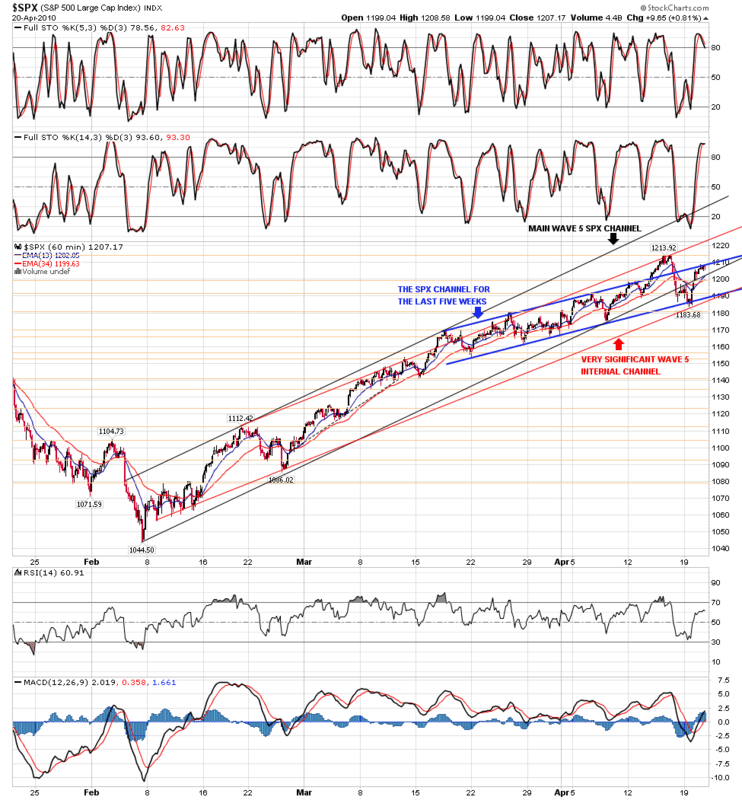 It has had one break through the top halfway through this wave up and is of particular significance at the moment because it defined both the recent SPX high and also the recent low. The third channel with blue trendlines has defined most of the SPX action in the last few weeks. I posted it yesterday and said it was likely to prove good resistance and that was right, with no move above it until after the close yesterday and, at the time of writing, ES has now moved back within this channel. The upper trendlines of these channels are the key resistance levels in the event that we make a new high today, and the key support levels in the event that we don't. In the event that we don't make a new high today, I would expect a pullback to the lower blue trendline in the 1190 SPX area. I posted this IHS at an earlier stage yesterday morning as a very speculative potential pattern, but the right shoulder is largely made now so it is a very real possibility for today. The neckline is sloping upwards slightly now, but that doesn't weaken the pattern and it is a very nice symmetrical pattern as it stands. If it were to play out then I would expect the right shoulder to trough near the 1202 ES level, probably no lower than 1198 ES. 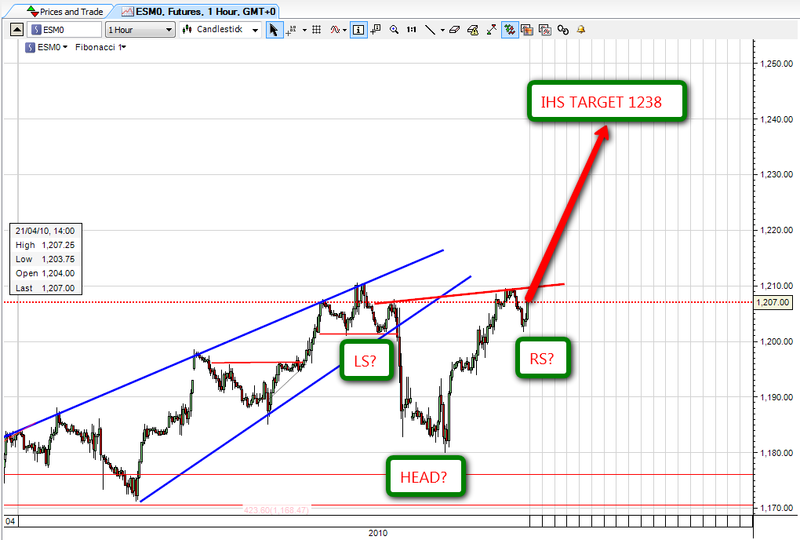 If the right shoulder is made and the neckline broken today, then the target is in the 1238 ES area. Depending on the time it takes to play out, that could fit exactly with a hit of the black channel upper trendline on the first chart. This is obviously a very speculative potential pattern, but in the event that the IHS plays out, then it would be a possibility well worth bearing in mind as major waves up or down often end with these patterns, as they did in both March 2009 and Feb 2010. Patterns have been good performers in the past on AUDUSD, as you can see from the chart, and it broke out of a rising wedge a few months ago, with a target of 62.5. Since that breakout, it has formed a right-angled and descending broadening formation, and it is currently very close to the top of that pattern at about 93. If it continues within the pattern, then the next target would be the lower trendline of the pattern, currently at 82.5, but very probably at 82 or 81.5 by the time it was reached. 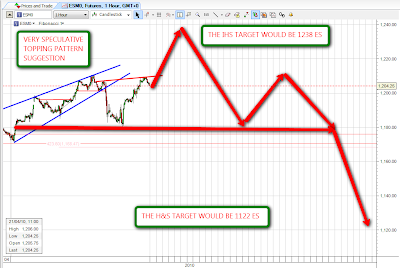 That would be a drop of more than 1000 pips. I think there's some more upside coming on AUDUSD in the very short term and there is a good chance that it may retest resistance at 94. If so, there would be a perfect entry for a short there with a stop at 95 and a reasonable expectation of reaching 82, so there would be credible risk/reward ratio on this trade of 1 to 12. In the event that AUDUSD reached 95 and the stop was triggered, then the pattern would be broken and resolving upwards. There would then be a good trade going long at 95 with a stop at 94 and a target of 98. The target would technically be 106.5, but these patterns aren't particularly good performers and often fall short, so I wouldn't be greedy. Like quite a few patterns, these are easier to trade while they are developing than after they break. Bulkowski has an excellent writeup for these patterns on his website, which is a very useful reference site for chart patterns and candlesticks. 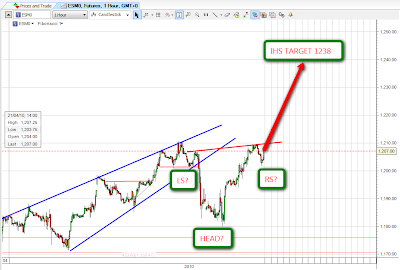 AUDUSD has failed to make a new high since the rising wedge broke and the action since has the look of a triple top. 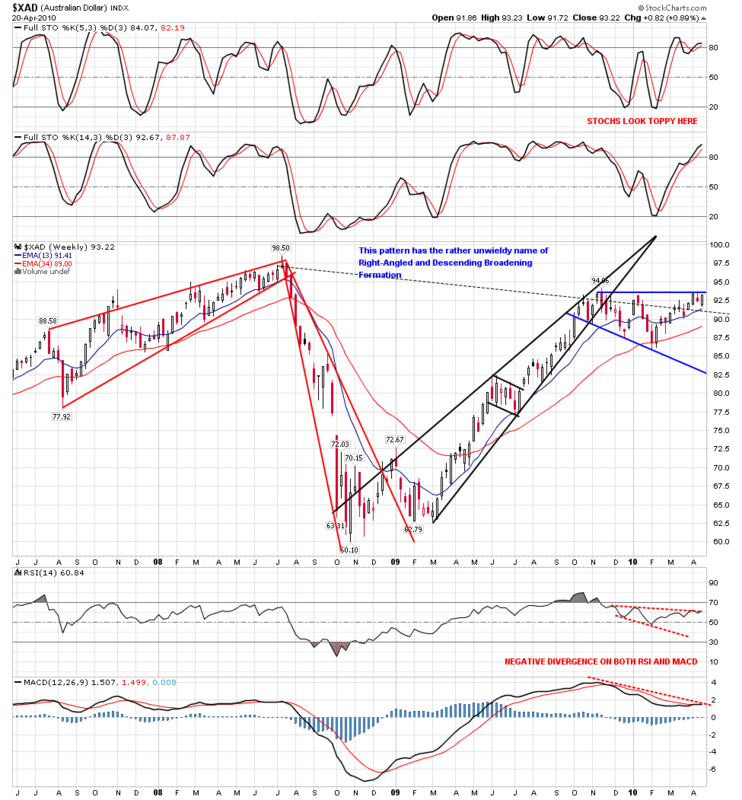 The broken rising wedge suggests that the next significant move is likely to be downwards. 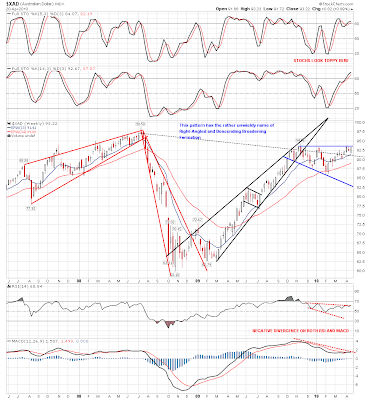 There is strong negative divergence on both RSI and MACD. The stochastics also look toppy here. Altogether it is much easier to make a technical case for AUDUSD falling from here. Good luck trading today everyone!